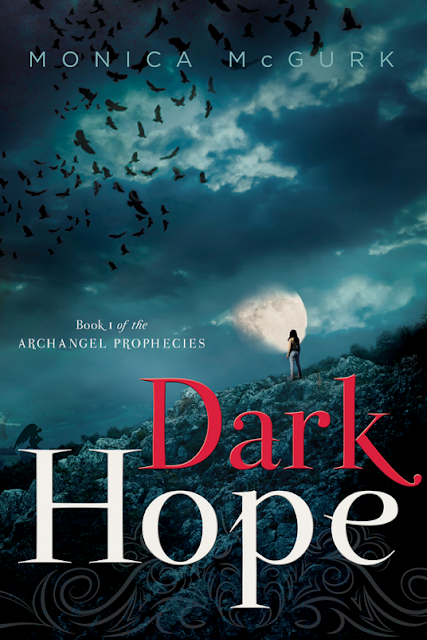 Dark Hope is well written and has a solid plot and characters. While I disagree with the premise of angelic and human relationships, it is an enjoyable read with plenty of action and drama. Hope seems to be a typical teenager, trying to fit in at a new school after requesting that her custody be transferred to her mother, a very busy business woman who is rarely home. Only Hope is far from typical, she was the victim of a child abduction when she was three and was found unharmed, apart from a mysterious mark on the back of her neck that looks suspiciously like a tattoo. And her abductor a pile of ashes in the adjoining bathroom. What happened? Michael another new kid at the school and takes Hope under his wing, warding off the unwanted attention of the school bullies who are intent on making Hope's time at the school miserable. Hope is thankful for him, and starts developing feelings for the boy who is always dressed in white. She misses him when he's not around - but where does he go for days at a time, and why is he so fascinated with world events, particularly those in the Middle East? As Hope and Michael work together to understand the implications of the strange marking on Hope's neck, other forces are chasing them to the finish line - can they outrun them and unravel the mystery? A thoroughly enjoyable read, I recommend this book to anyone who enjoyed the Twilight series.